In this post, I’ll explain how to download, install, and set up an Oracle Database on your own computer. Windows or Linux operating system. At the moment, there is no way to install Oracle on a Mac, unless you use a virtual machine such as Parallels. Visit the Oracle website at oracle.com. Go to the Downloads menu at the top. Select Oracle Database 11g Express Edition. Click on the link to the relevant version (Windows or Linux). Select the save location and press Save. Enter a password to use for both the SYS and SYSTEM database accounts. You will need this for logging in to the database later. Click Install after reading the summary. Click on the Java Platform JDK. The JDK download page is shown. Scroll down to find the installation files for the JDK for various operating systemsand file types. Choose your preferred file type and download. Save the file in your preferred destination. You should now be able to install the JDK on your computer. PS: I’m aware that the J in JDK stands for Java, and it’s a bit strange calling it the Java JDK as that actually means “Java Java Development Kit”, but it’s a bit easier for some to recognise if it’s mentioned as Java JDK. Run the file downloaded in the previous step (e.g. “jdk-7u25-windows-x64.exe”). Click Run if a security warning appears. Click Next on the Features screen (the default features are OK). The installation directory can remain at the default value. Wait for the JDK to be installed (approx 30-40 seconds). Accept the default installation for the Java Runtime Environment (JRE) and click Next. Wait for the JRE to be installed. Java JDK should now be installed on your computer. 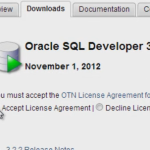 Select the Downloads tab, then under Developer Tools, click on SQL Developer. Select a download link for your operating system. The Oracle SQL Developer application can be run by opening sqldeveloper.exe. Click Yes if a warning for a certified version appears. I haven’t noticed any issues with this. Click Yes if another message for version incompatibility appears. Select the file types to associate with SQL Developer. I’ve selected all of them. Enter whatever your like as the connection name. I’ve used “Local”. This is the value that is displayed for this connection iwthin the application. The connection will be created and an connected to. SQL developer allows you to import and export connections, so you can ask a coworker to export theirs if you’re working on the same data. Well I hope this has given you some guidance on how to download, install, and set up an Oracle database on your computer. If you have any questions, let me know! Conglatulations for the good explanation on Oracle installation, it has been an headache for lots of people. Glad to have opened some people eyes!! I mean some people’s eyes.